Perkins+Will designed the new offices of telecommunications provider Cytracom, located in Dallas, Texas. When enterprise-grade VoIP business communications company Cytracom had outgrown their space, they enlisted Texas-based interior architecture firm Perkins+Will to build and outfit their new 8,292-square-foot office. 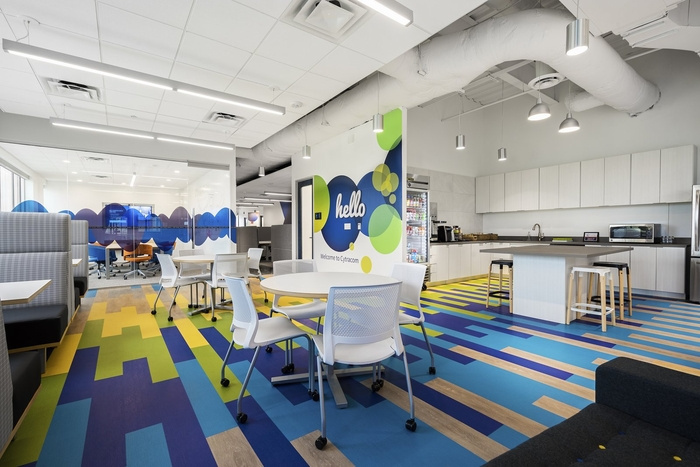 As the project’s interior architect, Perkins+Will designed a fresh and energetic workspace that incorporates clever graphics and brand colors throughout, providing the new headquarters with a sense of identity and high energy, which visually conveys their company culture. Satisfying Cytracom’s desire for a strong entry presence, Perkins+Will built a colorful community area and living room that capitalizes on the space’s natural light. The informal seating area and reception space is furnished with soft seating and banquettes, doubling as a break room for employees, intended to support flexibility as the company continues to expand both their workforce and presence in Dallas. Perkins+Will also employed a neutral palette with touches of green and yellow to add a fresh layer to the brand’s vibrant blue and orange hues. As visitors move past the entryway, they find a conference room large enough to accommodate office-wide meetings. Enclosed with glass, the visibility of the conference room is intended to energize both guests and workers. A series of adjustable workstations provide Cytracom employees a comfortable place to work, ranging from the marketing and channel teams situated closest to the entry, a secure area for the engineering team, and the support team found in the furthest reaches of the office.